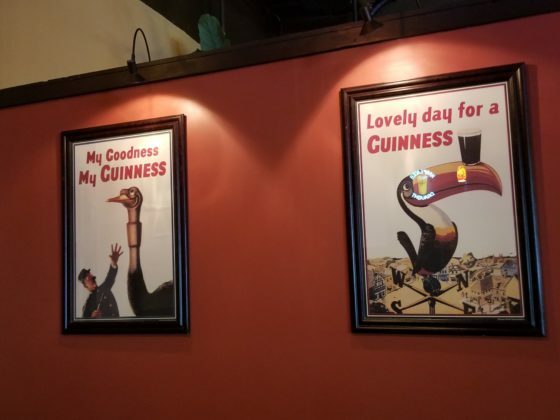 That’s what customers of The Harp Bar & Restaurant experience every time they visit the traditional Irish pub and restaurant, Kent’s newest hot spot. 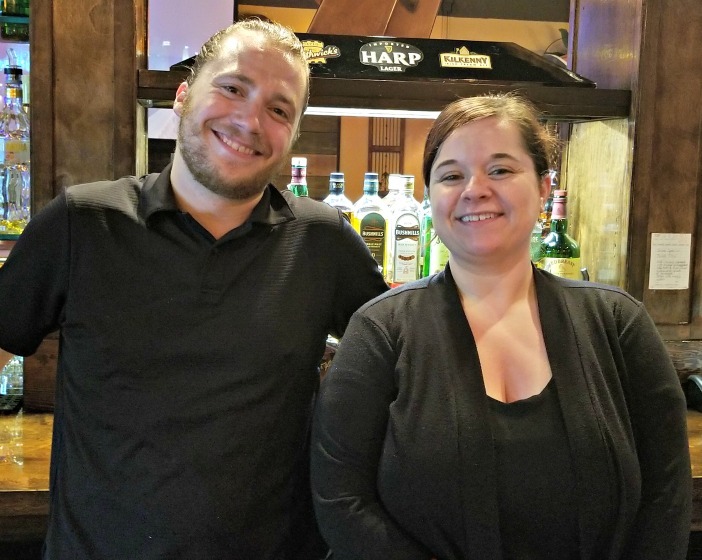 Located on Russell Road next to Best Western Plaza by the Green, The Harp was opened in May by Lorraine Torres and her husband Mac. 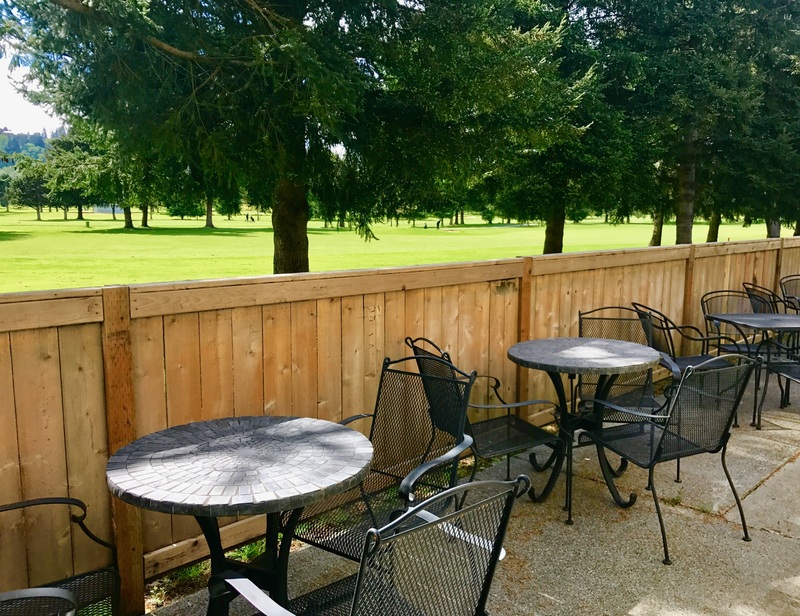 The bar-restaurant draws business travelers, golfers, couples out on the town, buddies sharing a brew and karaoke aficionados, as well as families, groups and kids’ sports teams who want a fun, safe environment to enjoy a tasty meal. 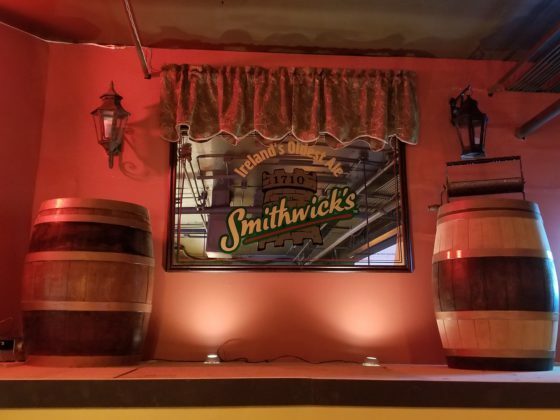 Lorraine previously managed Mick Kelly’s at Riverbend, along with two other Mick Kelly’s locations. 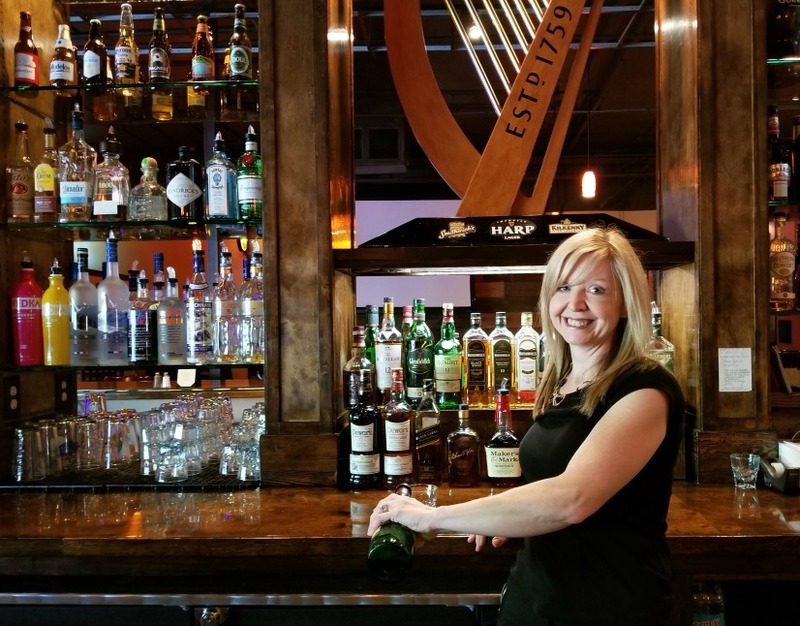 Though Lorraine had never dreamed of owning a restaurant or bar, when the Riverbend restaurant closed in the spring of 2015, she toyed with the idea of opening an Irish pub in Kent. Without telling anyone, Lorraine made an appointment to tour vacant restaurant space previously occupied by a couple of sports bars. The space was run down, but Lorraine could see the possibilities. After touring the space, she told Mac and her brother Mick Purdy about the idea. “I told them this is the place for me,” she said. In August 2015, she and Mac signed the lease and began creating what would become The Harp Bar & Restaurant. It took nearly two years to redesign, remodel and redecorate The Harp, but every color, finish and fixture was selected carefully by Lorraine. 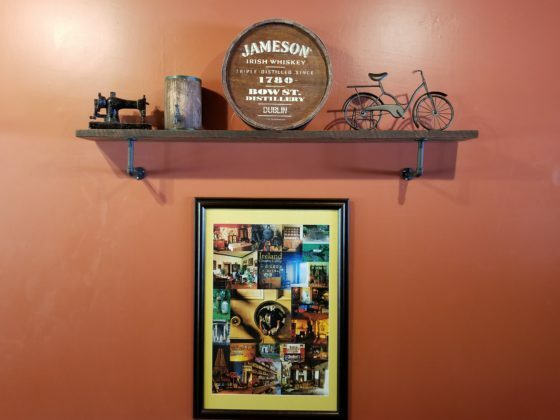 The bar became a family affair with Mac, Mick, and Mac and Lorraine’s three children, ages 15, 17 and 18, helping develop Lorraine’s vision for the place. Why an Irish pub? Because it feels like home, Lorraine said. 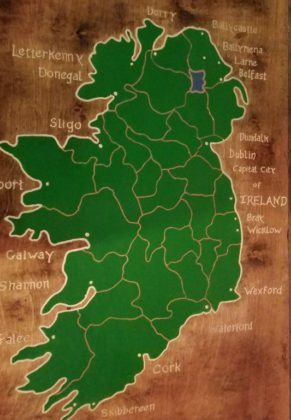 Lorraine moved to the U.S. from Belfast, Ireland when she was 20 to be closer to her brother who had already moved here. After a period of homesickness and adjustment, Lorraine eventually adapted to what she called “a whole new world.” Gradually, she made friends and met her husband Mac when they worked together at a furniture store in Seattle. They’ve been married for 21 years, and are embarking on a new adventure with The Harp. Why “The Harp”? 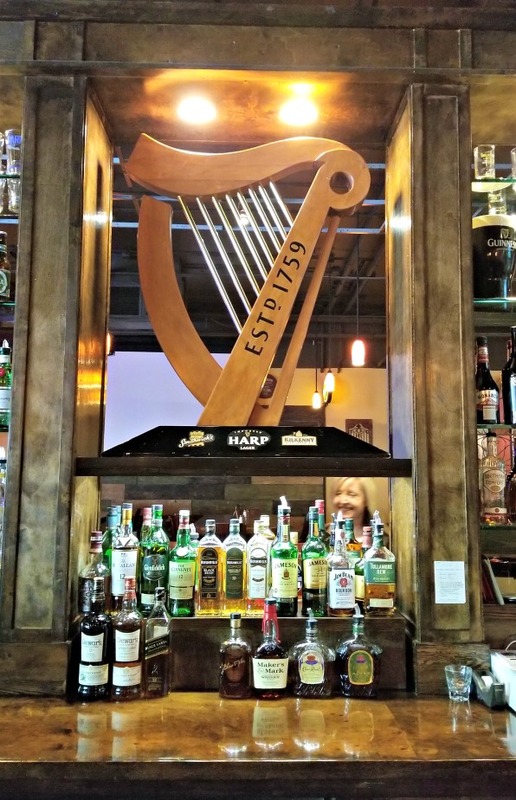 The harp is the national symbol of Ireland, and it just felt right, Lorraine said. The restaurant is decorated with harps, of course, as well as authentic Irish memorabilia including dancing shoes, a tin whistle and a bodhran (an Irish drum). Other artifacts, including pictures and posters, Lorraine picked up over the years from various places. 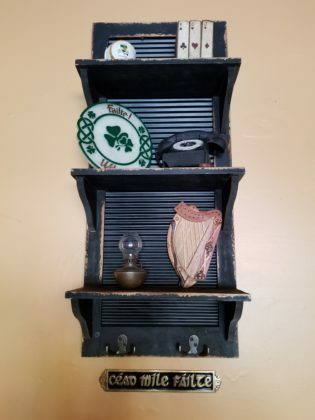 “I love finding old things and redoing them,” Lorraine said. Mick built the bar and the tabletops for the refinished barrels which serve as bases for some of the tables. 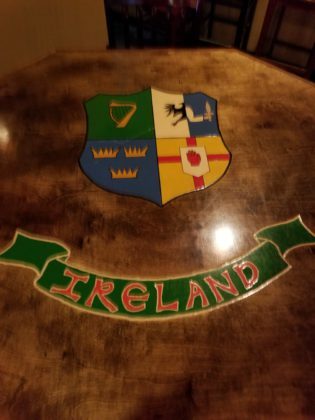 The tabletops include gameboards and Irish designs, including a map of Ireland, divided into provinces and the Seattle Sounders logo. Though Mick helped, he gives Lorraine all the credit for The Harp. “She was the driving force behind it. She had a vision for it,” Mick said. “She’s the hardest working person I’ve ever met,” said Mick, clearly proud of his sister. Carlos Sainz, who was the chef at Mick Kelly’s at Riverbend, now works at The Harp. Together he, Lorraine and Mick developed the menu, carrying over customer favorites from Mick Kelly’s like corned beef and cabbage, shepherd’s pie, and bangers and mash, and adding a few new dishes including sausage rolls, Harp bites and a veggie pita. 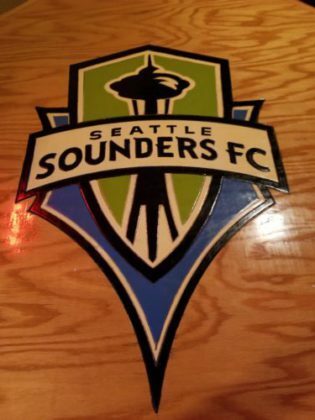 “He has helped me build the place,” Lorraine said of Carlos. 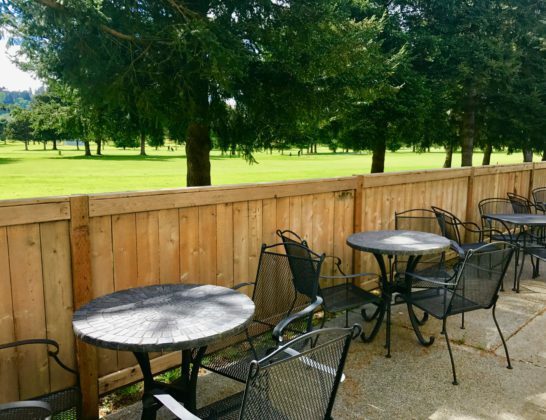 In addition to the delicious menu, happy hour specials and outdoor patio on the edge of Riverbend Golf Course, The Harp (24437 Russell Road, Kent, WA 98032) has 14 beers on tap, including three Irish beers – Smithwick’s, Guinness and Harp – bottled beers, a selection of Irish whiskeys, house wine and a full bar. The Harp is open from 11 AM to 11:30 PM, Monday through Thursday, 11 AM to 1 AM, Friday and Saturday, and 11 AM to 10 PM on Sunday. 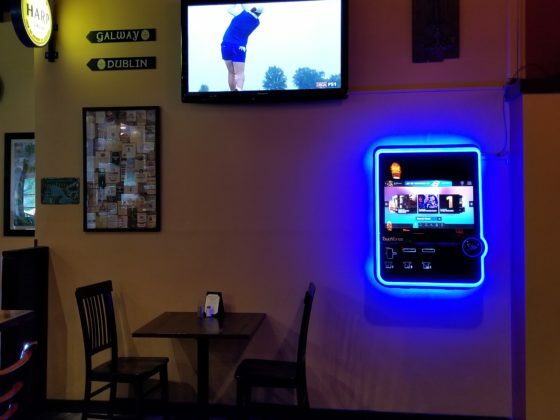 On Friday nights, karaoke starts at 9 pm. Coming soon: trivia night, live music, and a grand opening celebration. Not into karaoke? Sit at the cribbage table, play a game of chess or checkers, or watch a soccer game. Kent local Susan Bagrationoff has visited The Harp twice since it opened. 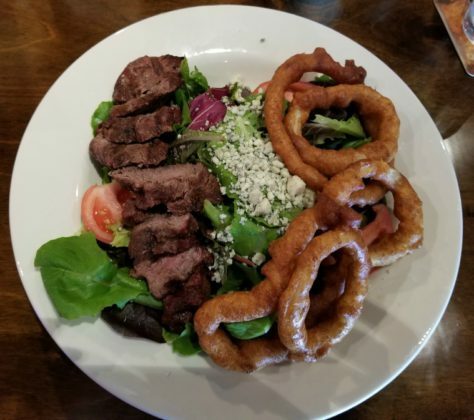 “I think the food and the atmosphere are beyond fabulous. They are fantabulous! There is nothing else like it in Kent,” Susan said. 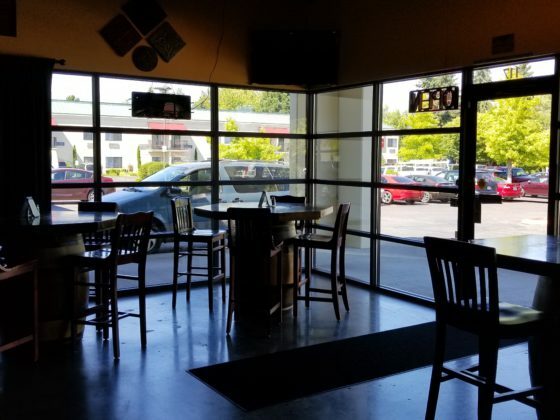 With a soft spot for nonprofits, The Harp plans to host regular fundraisers including an ALS fundraiser scheduled for August 12. The fundraiser was inspired by Colm Davis, a cousin in Northern Ireland who has ALS and works with special needs children. Colm will be in Kent for the event. 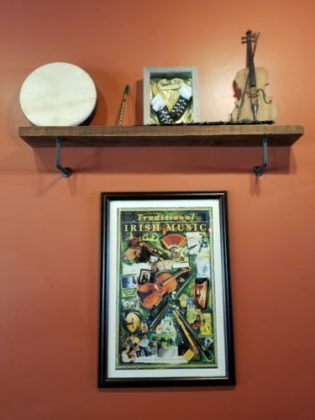 The Harp Bar & Restaurant…somewhere that you will always feel a hundred thousand welcomes. Copyright © 2017 Dana E. Neuts. All Rights Reserved.